Ari Goldwag: A Cappela Soul Cover and Preview! CHOL HAMOED SUCCOS 2 AMAZING SHOWS! Ari Goldwag is an American-born singer, songwriter, composer, and producer . He achieved fame as a soloist for the Miami Boys Choir at age 10 and starred on five albums and three videos before his voice changed at age 14. He launched a successful music career after his marriage and move to Israel. He has released seven solo albums, and composes songs and produces albums for other artists. In addition, he has released a unique “Sheves” series. Two are called “Sheves Achim” sung by 2 brothers Shimon and Moshe Bell – one when they were children and one when they were teenagers. He also released a new concept called “Sheves Chaveirim” sung by a choir of 5-6 boys so it’s not a group like Shalsheles Junior, but not a big choir like Miami. 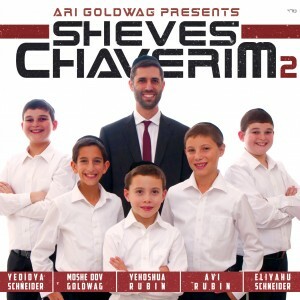 About 2 months ago he released the second volume of Sheves Chaveirim featuring an almost brand new cast. The only repeat performer is his son Moshe Dov. However, he is only repeat in person as his voice has really matured and he has developed into a fantastic star soloist. The other boys are Yedidya and Eliyahu Schneider and Avi and Yehoshua Rubin. 1. Shir Ushvacha – This song was composed by Rafi Gantshar. As part of his work in music, Ari gets to be involved in helping composers bring their songs to life so they can be heard by different people in the Jewish music business. So they come to him to make what’s called a ‘demo.’ Rafi Gantshar came to him with this song, and they did the demo, which got a lot of positive feedback and interest. In the end, Rafi agreed to have the song included in this album. The song is about praising Hashem, and the words are from the end of Yishtabach in Nusach Sefard. It is an upbeat song with some beautiful high solos. Ari and Moshe Dov do gorgeous backup vocals as he does throughout the album and Ari finishes off with his own solo. 2. Am Am Am – The words are actually Yismechu Bimalchuscha from Shabbos davening. Ari composed it originally for his Am Echad album, but it would have been a little odd to have 2 hit songs called “Am” Therefore, we are privileged to have it on Sheves Chaveirim. The song is out of this world and it featured gorgeous solos by Moshe Dov and also a bridge after it is sung the second time. It is actually faster than Shir Ushvacha so when you are expecting a slow song after a fast song, instead you get a faster song so perhaps the shock value adds to the appreciation of the song. over – nevertheless the main thing is not to fear. How can we ‘simply not fear?’ One of his main teachings is the idea of Emunah – trusting that although it is dark, the light is still there, and will return. Although things seem challenging and difficult, we can have faith knowing that one day we will know how Hashem’s hand held us all through the dark times. It is the first slow song of the album and it includes a bridge with English lyrics sung by Ari. Although it is a slow song, the guitars provide an upbeat rhythm to the song to inspire us to have emuna and overcome any challenge we might face. 4. Eliyahu – This song was composed by Moshe Dov Goldwag. This is a very catchy tune at about “hora” speed. Moshe Dov also put together the words for the low part. It’s very creative on his part because it changes the Eliyahu Hanavi song from zmiros into a tefilla to ask Hashem to send us Eliyahu hanavi and redeem us from this galus. 5. Tehilos – The low part’s lyrics are from what we say right before the Shmoneh Esrai at Shachris. The high part is ‘baruch hu u’varuch sh’mo’ – the line we say whenever we hear Hashem’s name in a bracha. It’s so easy to say these words many times a day without ever even noticing them, just like it’s easy to take the blessings in our lives for granted. Singing them in a song, repeating them with awareness, is a great chance to notice the words, and to notice our blessings. Ari composed it in 2009 after the birth of his daughter and felt very grateful to Hashem so he put together these 2 different phrases and combined them to form a gorgeous slow song . 6. Me’ien – This is a real fun song that is really catchy. Ari composed it together with his sister by the Shabbos table. The high and low parts can be sung together, so they could be harmonies to each other. Not only that, but the intro melody can also be sung together with the other parts so you can have 3 groups singing each part at the same time. The second time the song is sung, Moshe Dov has a great solo in the low part that ends off really high. This great song even inspired me to compose a song together with my daughter at the Shabbos table. 7. Borchu – Composed by Moshe Dov & Ari Goldwag This catchy tune first appeared in Ari’s Acapella Soul #2 that was released in 2014. This is more geshmak because it has music. 8. Rochel Mevaka – This song evokes strong emotion and longing as it talks about Rochel Imeinu crying to Hashem to have mercy on the Bnei Yisroel in galus. It was past her grave that we walked as we marched out of Israel in chains, and her tears are what evoke a consolation from Hashem that her children will return.Even as we see that return happening in front of our eyes, the exile seems to drag on endlessly. We need to recall her tears, and allow ourselves to cry, as well, as we face off with the challenges of galus today. It is really inspiring and tear jerking in a real positive way. You gotta hear it over and over to appreciate it . 9. Gam Zu – What a way to lift yourself out of melancholy after the previous song! Gam zu is a real leibedike dance song. It includes one of the alumni from the first Sheves Chaverim album – Yair Frohlich, as well as Elisha Willig, who was part of the group in the interim period and was a soloist on the Am Echad album in the hit song “Min Ha’olam” which featured Sheves Chaverim. 10. Hoshia Na – The only voices we hear in this song are Ari and Moshe Dov. Ari composed it in 2001 while he was learning in Mirrer Yeshiva and it was at a challenging time for the Jewish people. It is a unique style of slow song and it’s composed with words of begging Hashem for mercy and success. Since it was sung by the father and son duo, Ari added a bridge using the words “Kerachem av al banim” – as a father has compassion on his children, so may Hashem have compassion on us. 11. Nirkod Lanetsach – A translation from the original “Forever Dance” that appeared in Ari’s English Album that was released a little over a year ago. It has become very popular, and Ari wanted to give it new life, while at the same time introducing it to the Israeli public. To be true to the original composition in a different language that does not have the same expressions and ways of speaking is no easy task. The song concept comes out of the teaching of Chazal that in the future there will be a dance of the righteous in Gan Eden. We will all be part of the dance, as our chazal say ‘v’amech kulam tzadikim’ – all of us will ultimately reach a level of true righteousness. So if we’ll be dancing forever in Gan Eden, it’s a good idea to start practicing now! On a deeper level, what that really means is that we can already access the level of righteousness we will be on then – even now. To sum up I want to emphasize that Ari Goldwag is special and unique in that he is much more than just a singer. He puts real feeling and pnimiyus into his singing and songs that it inspires one to shape up in ruchniyos and to be optimistic and upbeat.